Chloropicrin is a soil fumigant used for its broad biocidal and fungicidal properties, primarily in high-value crops such as strawberries, peppers, onions, tobacco, flowers, tomatoes, and nursery crops. John Stenhouse, a Scottish chemist and inventor, synthesized chloropicrin in 1848. Because chloropicrin is toxic by all routes of entry, it has the potential for widespread destruction as a chemical warfare agent. For patient education information, see Chemical Warfare and Personal Protective Equipment. Chloropicrin is a colorless–to–light green oily liquid with an intense and penetrating odor. Even though chloropicrin is not flammable, it poses a significant explosion hazard if involved in a fire. Bulk containers of this liquid are shock sensitive and can detonate. Chloropicrin is an irritant to all body surfaces. This liquid decomposes in the environment. Photochemical reactions with chloropicrin produce phosgene; other decomposition products include nitrogen oxides and chlorine compounds. Chloropicrin photodegrades, with a half-life of 20 days. It is known to undergo violent reactions with aniline, 3-bromopropyne, sodium hydroxide/alcohol solutions, sodium methoxide, and propargyl bromide. Hazardous polymerization does not occur with chloropicrin. The chemical structure of chloropicrin is portrayed in the image below. The odor is a distinctive warning property of this liquid compound. *Concentrations expressed in parts of material per million parts of air or water. Contact with chloropicrin can lead to chemical burns or dermatitis manifested by red, cracked, irritated skin. The extent of skin injury depends on the concentration and duration of exposure. Contact with the eyes can cause pain, redness, and tearing. Prolonged eye exposure to chloropicrin can cause blindness. Entrance through damaged skin causes similar symptoms as those seen in overexposure through inhalation. If ingested, chloropicrin can cause burns to the mouth, throat, and esophagus. Other symptoms are similar to those of overexposure through inhalation. Ingestion of large quantities of chloropicrin liquid can be fatal. Overexposure to chloropicrin by injection can lead to redness and irritation of surrounding tissues. Other symptoms are similar to those of overexposure through inhalation. Dermatitis may result from repeated exposure to chloropicrin. 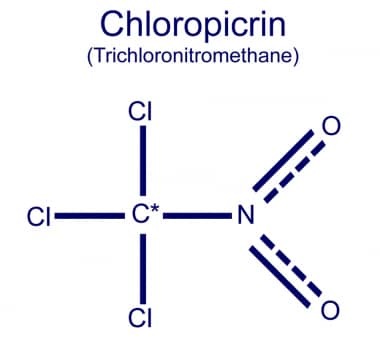 Chloropicrin is commonly used as a soil fumigant for agricultural pest control. Human exposures have occurred in the United States, usually in residential areas in close proximity to agricultural areas. Jiang W, Hernandez B, Richmond D, Yanga N. Harvesters in strawberry fields: A literature review of pesticide exposure, an observation of their work activities, and a model for exposure prediction. J Expo Sci Environ Epidemiol. 2017 Jul. 27 (4):391-397. [Medline]. Nagami H, Suenaga T, Nakazaki M. Pesticide exposure and subjective symptoms of cut-flower farmers. J Rural Med. 2017 May. 12 (1):7-11. [Medline]. [Full Text]. Gunier RB, Bradman A, Castorina R, Holland NT, Avery D, Harley KG, et al. Residential proximity to agricultural fumigant use and IQ, attention and hyperactivity in 7-year old children. Environ Res. 2017 Oct. 158:358-365. [Medline]. O'Malley MA, Edmiston S, Richmond D, Ibarra M, Barry T, Smith M, et al. Illness associated with drift of chloropicrin soil fumigant into a residential area--Kern County, California, 2003. MMWR Morb Mortal Wkly Rep. 2004 Aug 20. 53(32):740-2. [Medline]. [Full Text]. Honda H, Kawashima T, Kaku N, Kawasaki K. [A case of fatal chloropicrine poisoning induced by ingestion]. Chudoku Kenkyu. 2002 Oct. 15(4):381-4. [Medline]. Gonmori K, Muto H, Yamamoto T, Takahashi K. A case of homicidal intoxication by chloropicrin. Am J Forensic Med Pathol. 1987 Jun. 8(2):135-8. [Medline]. Prudhomme JC, Bhatia R, Nutik JM, Shusterman DJ. Chest wall pain and possible rhabdomyolysis after chloropicrin exposure. A case series. J Occup Environ Med. 1999 Jan. 41(1):17-22. [Medline]. Dow AgroSciences. Material Safety Data Sheet: Chloropicrin. Available at http://www.vikanemonitor.com/images/chloropicrin_msds.pdf. 7/22/99; Accessed: October 16, 2018. Gaskin S, Heath L, Pisaniello D, Edwards JW, Logan M, Baxter C. Dermal absorption of fumigant gases during HAZMAT incident exposure scenarios-Methyl bromide, sulfuryl fluoride, and chloropicrin. Toxicol Ind Health. 2017 Jul. 33 (7):547-554. [Medline]. Goldman LR, Mengle D, Epstein DM, Fredson D, Kelly K, Jackson RJ. Acute symptoms in persons residing near a field treated with the soil fumigants methyl bromide and chloropicrin. West J Med. 1987 Jul. 147(1):95-8. [Medline]. Harber LF. The Poisonous Cloud: Chemical Warfare in the First World War. 1986. 15-40. McEvoy GK, Litvak K, Welsh, Jr. OH. AHFS 96 Drug Information. 1996. 861-864, 2654-2657. Smart JK. History of chemical and biological warfare fact sheets. Special Study 50; US Army Chemical and Biologic Defense Command. 1996. Tintinalli JE. Emergency medicine. JAMA. 1996 Jun 19. 275(23):1804-5. [Medline]. Wilhelm SN, Sheipier K, Lawrence H. Environmental fate of chloropicrin. Fumigants: Environmental Fate, Exposure, and Analysis. 1996. Level A suit (DuPont Tychem 10,000). The authors and editors of Medscape Reference gratefully acknowledge the contributions of previous author, Joanne Williams, MD, to the development and writing of this article.